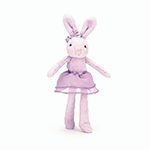 Jellycat Tutu Lulu Lilac Bunnys top tip for dancing is to try your best and always leap high with a smile on your face. And definitely have an aftershow snuggle - that’s very important! Tutu Lulu Lilac Bunny has matched her bow, tutu and fur - what a glamorous ballerina! She’s styled her elegant ears just so, and is ready to go on with the show! Pair it with Jellycats "Dance Bunny Dance" book (Sold Separately) to make a great Birthday, Baby Shower, or Just Because gift.